Ammar Mirza was recognised in the Queen’s Birthday Honours list for his tireless contribution to business and community life in the North East. A North-born entrepreneur who combines business with charity – and also finds time to host a radio show – has become one of the first British Asians in the North East to receive a CBE. Ammar Mirza, 41, was recognised in the Queen’s Birthday Honours list for his tireless contribution to business and community life in the North East. The married dad-of-two and former call centre worker, who has built up a strong and varied business and property portfolio, admits to being bowled over by the award. He is also a patron of Newcastle’ Freeman Hospital’s Charlie Bear for Cancer Care charitable fund, a board member of Marie Curie Development Board, and a chairman of governors of a primary school in Walker, Newcastle. And last year he set about engaging, inspiring and educating 10 and 11-year-olds in enterprise by founding the Primary Inspiration through Enterprise Project. 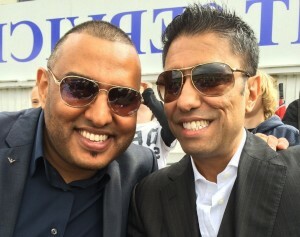 But Ammar, who co-hosts the weekly two-hour Business Show on Spice FM from its station at the Beacon enterprise centre in Newcastle, insists his CBE is an honour for the entire Asian community and its contribution to North East life. Ammar said: “I firmly believe this is not just for me as recognition of my personal achievements, but for the Asian community as whole, which has made such a wonderful impression on the region. “It has contributed much and has brought about integration, making a large and positive impact on the social and economic landscape. “I am incredibly proud and passionate about the North East. It is fantastic what we achieve as a region, and I’m very happy to be part of it and to have gained this award through my work here. “It’s fair to say that I was blown away when I got the call to say that I had been nominated and asking if I would accept. The former Heaton Manor School pupil was born in Benwell, Newcastle, and is one of nine children to parents who eloped from Pakistan and became teachers on Tyneside. He began work as an evaluation officer for the British Council in London in 1992, but returned to the North East a year later to manage a call centre in Newcastle. It grew to become Telewest Communications, for whom he was later responsible for IT service delivery for the whole organisation. Ammar, who lives in Northumberland with his wife Louise, a solicitor, and children Yasmin, 19, and 17-month-old Yousef, then became managing director of Clark Residential, which he helped turn into the largest independently-owned property firm in the North East. 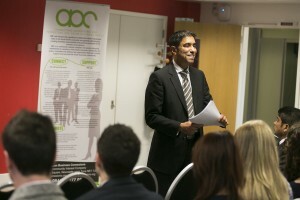 In 2008 he was appointed as a non-executive director of Your Homes Newcastle, and is also founder and chairman of Asian Business Connexions, a social enterprise that connects, supports and promotes the Asian and wider business communities and is based at The Beacon, in Westgate Road. Ammar holds a number of other directorships, is a fellow of the Institute of Leadership & Management, and has helped establish in excess of 200 new businesses and supported many more.